On Monday I ordered another PosterHänger, a product that makes for a great cheap (!) frame for just about any sized work on paper. Designed by Jørgen Møller, they range from 12 to 72″ in length. I just ordered a 72″ for Tom’s world map (which is about 69″ wide) that I’ll soon be hanging in our bedroom (Yes. We moved in a year ago and I’m just now hanging it… no big deal). 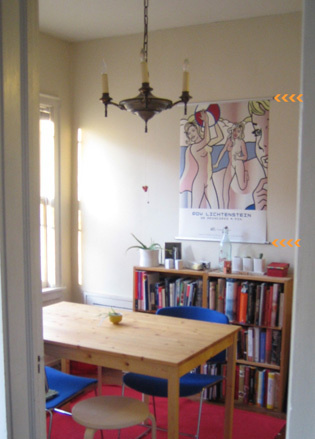 I’ve shared photos of our dining room before, but never specifically to highlight the frame with awesome orange arrows. If you haven’t heard of PosterHänger before, you’ve almost certainly seen them. They’re used a lot in retail shop windows to hang posters or advertisements. Look around the next time you’re at the mall if you’d like to check out a PosterHänger in person. There’s also a nice breakdown of the parts of a PosterHänger on their site. Just “Clip, Slide, Häng” and you’re done. I placed my most recent order directly from posterhanger.com, but in the past I’ve found them for less at Fulcrum Gallery’s website where there is a more limited selection. FG’s prices are actually higher; they have an ongoing 15% off promotion that can sometimes make up the difference. Thanks to Julia ordering one as well, however, we are both enjoying the “buy two, get free shipping” offer from posterhanger.com. Assuming I can get a decent photo, I’ll be sure to share the results of the map hanging when it’s all finished. This entry was posted by Martha on Thursday, June 4th, 2009 at 8:00 am and is filed under Apartment, Art + Craft. You can subscribe to responses to this entry via RSS. This is greät! I äm so excited to häng the mäp!